I quite enjoyed this production, but be forewarned the title is misleading for two reasons. 1. Hubble doesn't shoot in 3D. 2. This is not a photo album of Hubble's extensive collection. 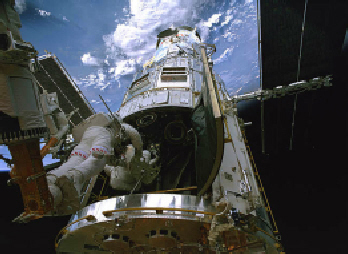 This documentary shows audiences just how important the shuttle missions are to scientific space observatories like Hubble. The shuttle launches, shot in 3D, are fantastic! The sound rocks the theatre. If you've ever envied those tough sorts who've managed to fit a trip down to Florida's Kennedy Space Center -- envy no more. For about 10 bucks you can "virtually" experience two of them -- and with zero delay! That Imax screen is so high, you might even get a crick in your neck as the craft shoots off the Earth. Plus, albeit low-res, watch as the empty jet boosters drop from a 3D cam Nasa had mounted to the outside of the space craft itself. Fun. Welcoming and warm, the actual people involved in these missions are presented with all the rich, quirky, imperfection of humanity. I greatly appreciated that astronauts, scientists and support crews let their hair down, displaying the whole adventure, fun, daring, and sweaty hard-work in a real, informal way. This is a Nasa you'd like to hang out with. Their quips are truly representative of the excitement of discovery, and more often philosophic than technical. "Waking up on the day of the launch, I felt like a kid on Christmas Day." And embedded in Leo DiCaprio's well-read narration: "In the process of going to the moon, we discovered Earth." A thought provoking quote accented nicely with a strong score and excellent choice of song: "Somewhere over the rainbow"
Here's my only problem with the production, it failed to clarify the following, and in doing so, missed the opportunity to explain cool imaging techniques. I'm rather certain none of these 3-D images were shot by Hubble. That is, Hubble is not a 3-D telescope, I'm pretty sure there is no such thing (perhaps binoculars would be the closest thing). These objects being photographed are so far away, a pair of lenses mounted on the same orbiting craft (which Hubble is) couldn't possibly render much of a 3D image. Even if two crafts, at opposite ends of a solar orbit could sync and pair images, I still think the objects outside of our solar system would hide their third dimensions. Probably the 3D images were created digitally from Hubble's already cool even-in-2D images. Then these 3D images were integrated into spectacular animations that rival the night sky of the best planetariums. It's some cool stuff. And rather than being shown a plethora of Hubble shots, this method sets audiences drifting weightlessly deep into and handful of Hubble's juiciest nebula and cluster shots. Despite the misleading label, this is a high quality product. Hubble 3D Imax. Copyright © 2010. Written and Directed by Toni Myers. Imax/Warner Brothers.